My aunt said the reason why she loves the Samoas cookie so much is that they are composed of her two favorite cookies: shortbread and coconut macaroons. So since we were making the Samoas and Coconut Macaroons, I figured we might as well do separate shortbread cookies too. My philosophy is you're going to make a mess in the kitchen when baking anyway, so might as well bake as much as you can in one sitting. Preheat the oven to 350 degrees F. In the bowl of an electric mixer fitted with a paddle attachment, mix together the butter and 1 cup of sugar until they are just combined. Add the vanilla. In a medium bowl, sift together the flour and salt, then add them to the butter-and-sugar mixture. Mix on low speed until the dough starts to come together. I will warn you, our batch came out really crumbly. We had left the butter out but it's quite chilly these days so it didn't quite soften as we would have liked, so I just ended up using my hands to soften and warm it up. In the end, the dough came together and we ended up forming three small disks of dough. Wrap the dough in plastic and chill for at least 30 minutes. When you're ready to take it out of the fridge, start flattening out the dough with the plastic wrap still on it. The dough starts to break apart if you unwrap it and roll it out. We flattened it to about an inch thick and started cutting it into 1/2 inch slices. We then cut them in half to make little finger shaped dough pieces. When the cookies are cool, place them on a baking sheet lined with parchment paper. 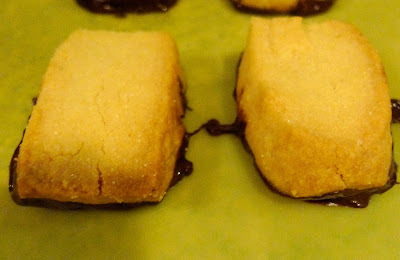 We used the leftover chocolate from the Samoas cookies to dip some of the shortbread cookies. Here is a plate of the cookies we made that night for my aunt and uncle, who stayed up past midnight to eat these cookies. Talk about dedication. you auntie love samoas too?? that's why i love ur family!! do you have a good recipe for strawberry shortcake? I usually like strawberry shortcakes that are made with biscuits, fresh strawberries and fresh whipped cream. But there's tons of variations, so I guess it depends on what you like. I left my stash of recipes at home, but I can help find one for you online if you's like. If there's a Grand Lux near you, they have a pretty good one with ice cream too.